One of the most popular in situ activation reagents in solid and solution phase peptide synthesis. In addition to having high reactivity, TBTU have also been shown to limit enantiomerization during fragment condensation. TBTU belongs to the family of Guanidinium and Uronium salts. It affords fast amide bond formation and can be very useful for the coupling of sterically hindered amino acids in peptide synthesis. TBTU is useful for the deprotection of tetrahydropyranyl, silyl ethers, and 4,4’-dimethoxytrityl groups. This reagent allows the removal of THP ether in the presence of TBDMS group as well as the selective cleavage of DMT functionality over TBDMS ether. 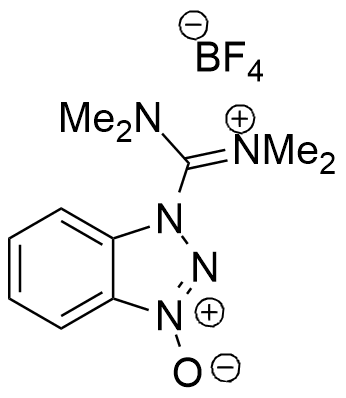 This selectivity is of use in a variety of synthetic applications. It has been employed by Simoneau and co-workers at Boehringer-Ingelheim in Canada for the large-scale preparation of orally active renin inhibitor BILA 2157 BS. TBTU has also been reported by researchers at Boehringer-Ingelheim in Canada during the multigame preparation of macrolactam BILN 2061, an HCV NS3 protease inhibitor for the treatment of hepatitis C.
E. Valeur and M. Bradley Chem. Soc. Rev., 2009, 38, 606-631. K. S. Ramasamy, D. Averett Synlett, 1999, 6, 709–712.